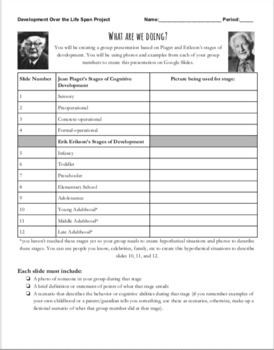 Students will learn all about the stages of development using key psychologists like Jean Piaget, Lawrence Kohlberg, and Erik Erikson. 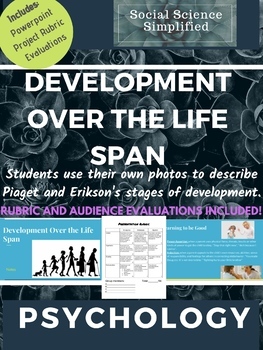 They will then use the information to create a group presentation where they use their own childhood photos and experiences to describe what happens to a human as they progress through the various stages. 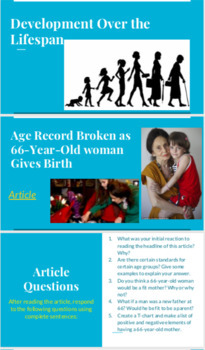 -A PDF of an article titled: How old is too old for Motherhood which used in the powerpoint about a 66-year old woman who gave birth to help students analyze their own biases in analyzing developments.